It’s rare that you can point to a single moment in a baseball game and say with certainty that it set a tone that lasted well beyond that game. But such a moment happened on this day in 1996, in Game 4 of World Series between the Yankees and Braves. That’s the basic, level-headed way to say it. A different way to say it: I still can’t believe the Braves lost the 1996 World Series. Actually, that’s a pretty basic and level-headed way to say it, too. We’ll get to that big moment in a minute, even though you already know where this is going. Spoiler: It’s Jim Leyritz’s homer. David Cone pitched a great game in a must-win situation. Also, the Yankees weren’t total pushovers. This can’t be emphasized enough: The Braves led 6-0 — SIX TO NOTHING — at home — AT HOME — in Game 4. A win would’ve put them up 3-1 — THREE TO ONE — in the series, with established postseason ace John Smoltz — ESTABLISHED POSTSEASON ACE JOHN SMOLTZ — ready to clinch in Game 5. Any reasonable observer would’ve put the Braves’ chances of winning Game 5 — and their second straight title — at about 75 percent, perhaps higher. That’s how in control the Braves appeared. As you know, the big moment in Game 4 was Leyritz’s three-run, game-tying homer in the eighth inning. Mark Wohlers, despite owning a triple-digit fastball, threw Leyritz a bunch of sliders, none of which really slid, and eventually hung one with two strikes that Leyritz put over the fence. Watch the whole at-bat here, complete with various “Wohlers shouldn’t be throwing so many sliders” talk from analysts Tim McCarver and Bob Brenly. The moment the homer landed, two identities solidified, and that’s the real legacy of the home run. 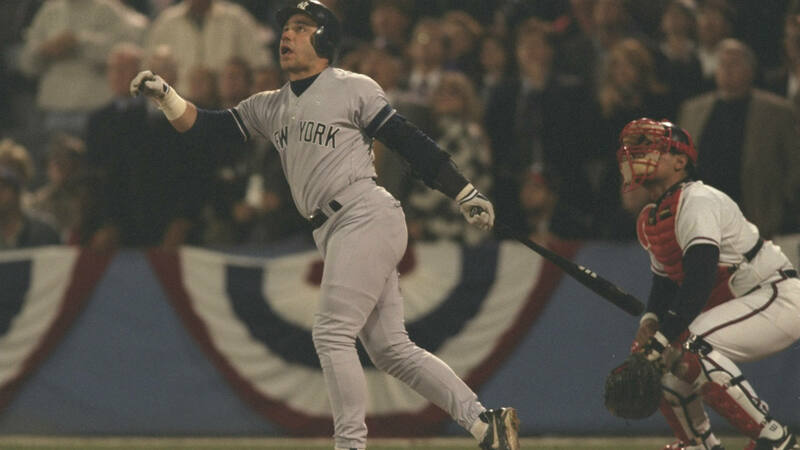 Leyritz’s blast not only shifted the tone of the game, but it also sent the Yankees and Braves in different postseason directions. The Yankees became a dynasty that seemingly always won when it mattered most. The Braves became official underachievers who always seemed to come up short when they should’ve come up big. The Yankees already had a ton of championships, so the ’96 title just brought them back to prominence. The Braves had fallen short in 1991 and 1992, and lost in the NLCS in 1993, before finally winning it all in 1995. The ’96 loss just re-established the “can’t win the big one” label that would follow them for the remainder of the decade and into the 21st century. And, yes, the Braves still had plenty of time to score runs in Game 4; the 8-6 final score took 10 innings. And they still had Smoltz in Game 5, but that one ended up being a different kind of heartbreaker: a 1-0 loss on an unearned run, and 0 for 7 with runners in scoring position (which included failing to tie the game in the ninth after Chipper Jones led off with a double and made it to third with one out). And they still had Games 6 and 7, but only one of those ended up being necessary. So, to sum up again, the Braves held a 2-0 series lead, had a 6-0 lead in Game 4 at home with a chance to go up 3-1, yet let everything slip away and lost the series in six games. It still boggles the mind. Best not to think about it if you’re a Braves fan. The theory that everything changed for both teams isn’t just something I cooked up. “I still think 1996 was 100 percent the year that changed everything for us, because if we win, it sets the stage for us winning maybe four out of five times in the World Series,” Smoltz told Sports on Earth in 2015. The Braves and Yankees met again in the 1999 World Series, with New York winning in a sweep. But there was a moment in that series — also in Game 4, also in the eighth inning — that served as a reminder of the series three years earlier, and of its last effects. With the Yankees up 3-1 in the game, and in complete control despite a mere two-run lead, Leyritz — who was back with the Yankees after stops with the Angels, Rangers, Red Sox and Padres — came up to pinch hit with two outs. On the seventh pitch of the at-bat, he homered to left-center. It was a mostly meaningless run, but it seemed to taunt the Braves nonetheless, a final stamp on a decade full of what-ifs: Hey, remember me? I’m Jim Leyritz, the ultimate godfather of your postseason heartbreak. The Braves haven’t been to the World Series in the 21st century. The Yankees last won it all in 2009. Both teams are now young and exciting, and good candidates to meet again in Fall Classics to come. Of course, nobody’s left from those ’96 rosters. There are new legacies to be made for both teams. For now, though, Leyritz’s series-changing, legacy-defining homer is a ghost that still haunts.